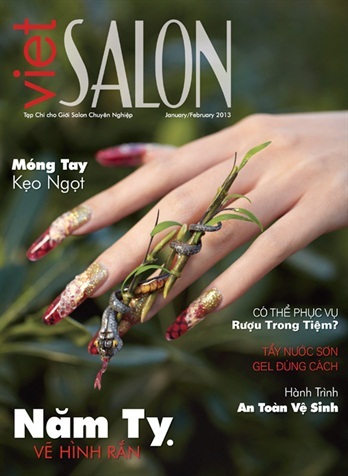 VietSALON Magazine, sister publication of NAILS, celebrated the Lunar New Year 2013 Year of the Snake with a 3-D acrylic snake sculpted by Sindy Mark, creative director for Kupa Inc. For the VietSALON cover, Mark combined real snakeskin with faux snakeskin designs and sculpted a 3-D snake on oval acrylic extensions using Artfinity and Divinity products from Beautiful Nails by Kupa. 1. Apply the forms and sculpt a paper-thin foundation using Divinity traditional clear acrylic. 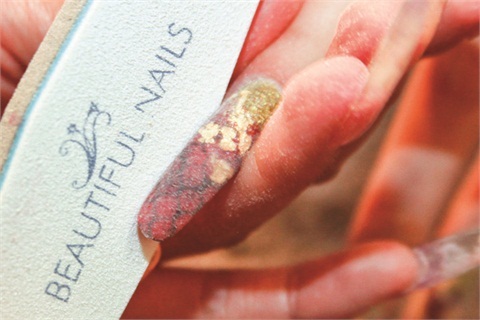 Apply Artfinity gold glitter acrylic starting at the cuticle, fading it to the center of the nail bed. 2. Start the red glitter acrylic from the center of the nail bed where you left off. While it’s still wet, fade it into the gold glitter, giving it an ombre effect. 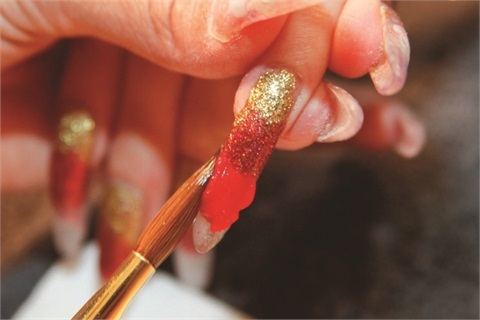 Use red acrylic powder from where you left off through to the tips and blend it with the red glitter. 3. Once the red acrylic is fifty percent dry, take a piece of nylon netting and press it down on the red acrylic. It creates a textured indentation for the snake pattern. 4. Apply black acrylic over the textured/indented red tip. Let it dry. Remove the excess black acrylic by filing until you see the netting snakeskin pattern. Dust off the nail. 5. Apply gel to the area where you want the gold leafing. Using tweezers, take a few gold leaf pieces and apply it randomly onto the gel. Use tweezers to handle the gold leafing. Flash cure for 30 seconds. 6. Cover the entire nail with clear acrylic. File the nail surface using an electric file with a medium carbide bit. 7. 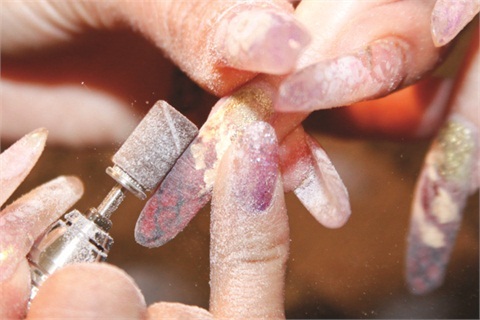 Use a fine sanding bit over the entire surface of the nail to smooth the nail edges and nail beds. 8. 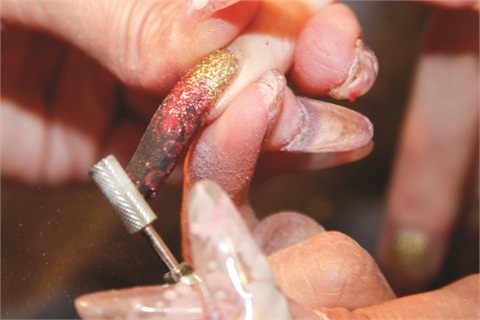 Refine the nail shape using a shaper buffer file. 9. Use an under nail cleaner bit to remove excess acrylic under the nail. Wipe the nail clean with a surface nail cleanser. 10. Apply UV Phoria gel over the entire nail. Cure for two minutes. 11. Brush on a small amount of glue to the area you want to apply the snakeskin. 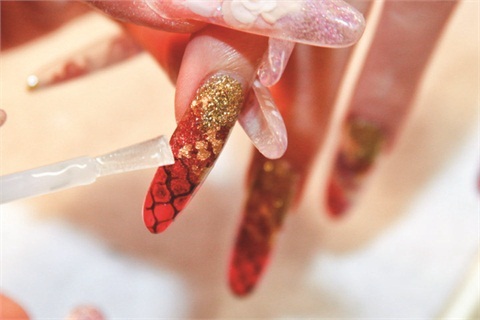 Take a piece of the snakeskin and place it onto the nail. 12. Use saran plastic wrap and apply pressure to hold the snakeskin in place. The build of the snake was a little complicated, built in three sections. The head was created using white acrylic. The majority of the body was sculpted on a basic canvas for the body and length. She then created a corkscrew shape for the tail by sculpting around a straw. The three parts were then connected and e-filed. Mark used lace as a stencil while airbrushing, then hand-painted the rest with an acrylic water-based paint. SPONSORED CONTENT: DeEnterprises offers bulk discounts on all all your professional product needs. Browse their website for ideas on saving money for your salon purchases.